UN Secretary-General: Any issues not directly related to the Iran nuclear deal should be addressed without prejudice. UN Secretary-General Antonio Guterres warned on Wednesday that any issues not directly related to the Iran nuclear deal “should be addressed without prejudice to preserving the agreement,” according to Reuters. The comments came days after U.S. President Donald Trump extended a waiver on nuclear sanctions that were imposed on Iran. However, he said it would be the last time he will do so and added that European allies and Congress have to work with him to fix “the disastrous flaws” in the 2015 nuclear deal. “The (nuclear deal) constitutes a major achievement of nuclear non-proliferation and diplomacy, and has contributed to regional and international peace and security,” UN spokesman Stephane Dujarric told reporters on the second anniversary of the implementation of the deal between Iran and key world powers. 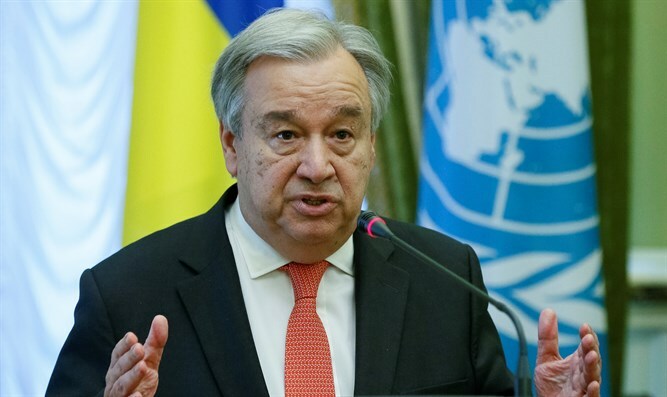 Guterres called for concerns relating to the implementation of the nuclear deal “to be addressed through the mechanisms established by the agreement,” Dujarric said, according to Reuters. The parties to the nuclear deal created a joint commission to handle any complaints of breaches. If the complaining state is not satisfied with how the commission addresses its concerns, it can then take its grievance to the UN Security Council. If the Security Council receives a complaint of a breach it would then need to vote within 30 days on a resolution to extend sanctions relief. If it fails to vote, the sanctions would be automatically re-imposed. Earlier this week, Russian Foreign Minister Sergei Lavrov said that Moscow will not support attempts by the United States to modify the Iran nuclear deal. In addition to its nuclear aspirations, Iran’s ballistic missile program has also been a cause of concern. The Islamic Republic has several times test-fired ballistic missiles in recent months, raising the ire of the West.